ESPN.com Article "Past champions raise the bar at Indy"
"See?" He shouted over the century-old four-cylinder engine. "Other places with this kind of history, they talk about having ghosts. Here at Indianapolis our ghosts are still alive." During this throwback weekend for the ages, they certainly were. So many ghosts, it became hard to keep track of them all. There were five former Indy 500 winners in Sunday's 33-car field and what seemed like another 50 wandering about Gasoline Alley. 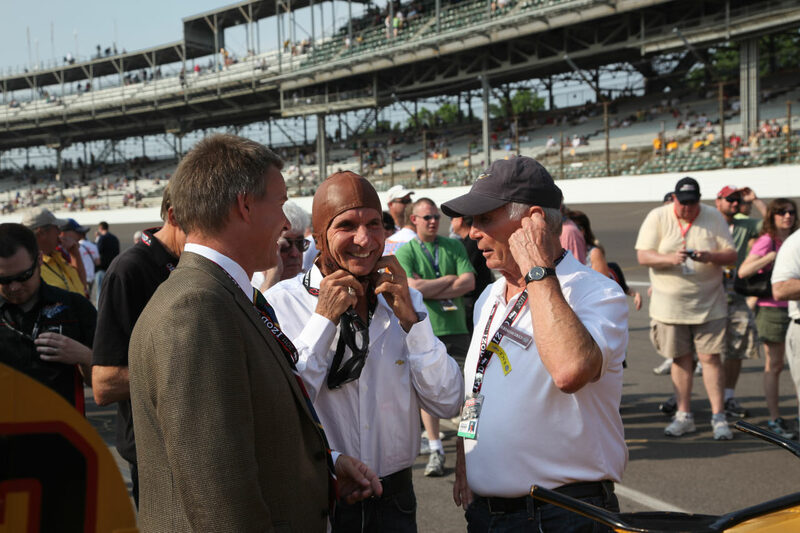 Unser was joined by his brother Bobby, a three-time winner, and son Al Jr., a two-time victor. Johnny Rutherford, also a three-time champ, smiled and worked the crowd just as smoothly as he always has. Parnelli Jones, the 1963 winner, navigated the crowded garage behind the wheel of a golf cart. Then the 77-year-old slipped behind the wheel of the car that won the inaugural 500, Ray Harroun's bright yellow, cone-tailed Marmon Wasp, wheeling it for two emotionally charged ceremonial pace laps. During the first he was followed by a pack of cars that had also chased the Wasp back on May 30, 1911. During the second he led a line of 11 former Indy 500 champions, cruising the 2.5-mile rectangle in a kaleidoscope of classic racing machines. Then he pointed to Bobby Unser, driving Dawson's '12 National. "We should have let you borrow Fittipaldi's helmet. Did you see that thing?" Earlier in the day, Emerson Fittipaldi, the '89 and '93 Indy 500 winner, had driven one of the 1911 vehicles, complete with a leather helmet that looked like something he'd stolen from Red Grange's locker. There were laughs when he put it on and there were laughs when Foyt brought it back up. Come to think of it, there were laughs for a full two weeks. "It's been like this since we got here earlier in the month," Roger Penske admitted on race morning while overseeing the final preparation of his three cars. "Last weekend they had every driver who had ever run even one lap in this race. So many old friends and rivals you couldn't shake all their hands. People I hadn't seen in decades coming up and congratulating us on the success we've had here. It's truly humbling." But no matter what their level of fame, they were all in agreement on a topic that none of them saw eye-to-eye on for more than a decade. They all agreed the race they love so much felt like the old days again. Not because of their presence, but because of the lines they saw at the box offices on race morning and the vibe that everyone felt rolling down from Sunday's packed house. "There's certainly an energy here today that maybe we haven't seen for a while," said Rutherford in a not-so-subtle reference to the Champ Car/IndyCar schism that tore the sport in half and weakened its signature event. "And it's not just in the grandstand. It's also been evident down here in the Indy 500 Old-Timers Club." During the 500's centennial celebration, they got it, capped with a "What the heck just happened?" finish. Rookie J.R. Hildebrand, like Ralph DePalma 99 years earlier, was running away with the win. But when he suddenly smacked the wall in the final turn of the race, he joined the likes of Michael Andretti, Scott Goodyear and Robby Gordon as members of the Indy 500 heartbreak club. Meanwhile, Wheldon was ushered into the realm of the two-time winners club, joining the legendary likes of Unser Jr., Luyendyk and Fittipaldi, not to mention Rodger Ward, Bill Vuckovich and Gordon Johncock. Heck, we even had ourselves a good old-fashioned "let's check the replay" review of the finish. "All the greatest names were here and we ended up with one of the greatest finishes of all time," said third-place finisher Graham Rahal, son of '86 winner Bobby. "I'm not sure what else you could have wanted today." And it all started not with the 224.290-mph lap with which Wheldon took the checkered flag, but instead with a bunch of old men, including Rahal's father, driving restored jalopies at speeds topping out at about 30. "It could go faster, you know?" said Unser, taking one last look at Dawson's blue barrel and then pointing to the two levers mounted alongside a cockpit wall that consisted of little more than a sheet of snapped-on leather. "Let me get that steering wheel in one hand, that handbrake in the other, and take it up through that dirt parking lot over there. We'd find some speed in it then." The living ghosts of Indianapolis would have loved that. Almost as much as they loved Sunday's finish. Found Vanderbilt cup race 1st place trophy cup -last date 1958-who was it awarded to?